The new royal baby has a name! Kensington Palace revealed Friday that the new royal baby boy has been named Louis Arthur Charles. He will be known as His Royal Highness Prince Louis of Cambridge. Little Louis was born on Monday, April 23. 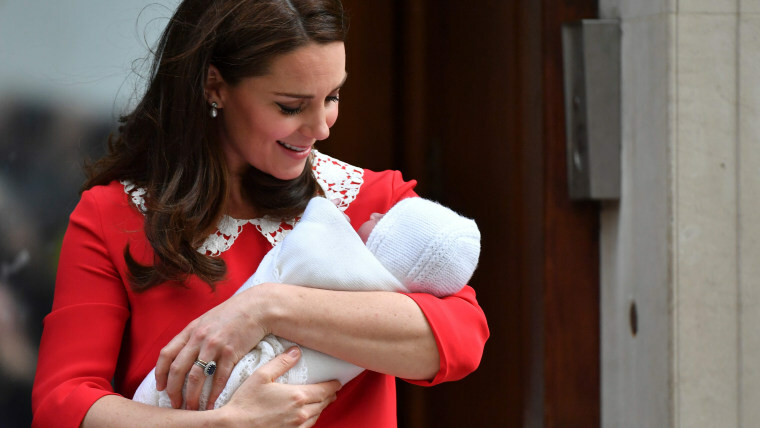 Just seven hours later, his parents, Catherine, Duchess of Cambridge, and Prince William, left the hospital with the new prince in tow. Of course, the family was able to squeeze in a quick visit with Louis's siblings, Prince George and Princess Charlotte, before heading back to Kensington Palace. Louis, a popular French name used for generations by royalty in that nation, could be a tribute to a number of family members of the new British prince. Most likely, his name honors Lord Louis Mountbatten, uncle of the baby’s great-grandfather, Prince Philip, the husband of Queen Elizabeth. Lord Mountbatten was considered an influential mentor to Philip and Elizabeth's oldest child, Prince Charles, the heir to the British throne. Mountbatten, a British naval officer who was assassinated by the Irish Republican Army in 1979, is part of the surname of the royal family: Mountbatten-Windsor. In addition, both Prince George and Prince William have Louis as part of their middle names. Charles, the other middle name of the new prince, is a nod to his grandfather, Prince Charles. Prince Louis is now fifth in line to the British throne. Currently standing in line behind his grandpa Prince Charles, are his dad, his big brother and his big sister. Charlotte's position is significant; this is the first time in the history of the British monarchy that a princess hasn’t been bumped in the line of succession based on her gender. Welcome to the family, Prince Louis!